Until the mid-19th Century, the biblical account of the creation of life and the universe was widely accepted within Christendom. In other words, Christians accepted the biblical revelation that the material world was created in six literal days about 6,000 years ago. But when Darwinism exploded on the scene, Christian leaders sold out quickly to the theories of scientists that the universe is billions of years old. To accommodate that supposition, Christian theologians developed the Gap Theory and the Day-Age Theory. The Gap Theory argued that there are billions of years between the first two verses of Genesis. In other words, God created the universe and then it was despoiled by the revolt of Satan, and billions of years later, God re-created the universe. The Day-Age Theory postulates that the creation days of Genesis were really days that lasted millions, if not billions, of years each. 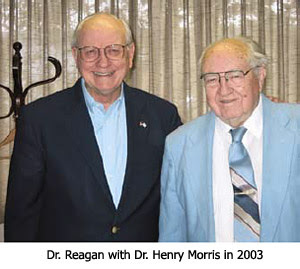 The man who almost single-handedly revived the biblical view was Dr. Henry Morris (1918-2006). Dr. Morris graduated from Rice University with a bachelor's degree in civil engineering in 1939. Later, in 1950, he earned a doctorate in hydraulic engineering from the University of Minnesota. He then served as a professor of applied science at Southern Illinois University (1956-1957), and subsequently as professor of hydraulic engineering and civil engineering at the Virginia Polytechnic Institute and State University (Virginia Tech), where he also served as the department chair. In 1961 Dr. Morris teamed up with a theologian named John C. Whitcomb, and the two of them wrote The Genesis Flood, which advocated supernatural creation by God and attributed the fossil record to the Noahic Flood. In 1963 Morris and nine others founded the Creation Research Society which was committed to reaffirming the biblical story of creation. In 1972 he established the Institute for Creation Research which produces scientific studies that affirm a young earth and refute the Theory of Evolution. In recent years, many other Creation ministries have been established and the number of scientists speaking out against evolution and in behalf of a young earth has steadily increased. The time is long overdue for Christian leaders to join that chorus of voices. Unfortunately, most of those leaders today are either silent about Creation, or else they continue to try to conform the biblical revelation about the Creation to the opinions of scientists. I spoke out strongly in behalf of the biblical revelation that the Creation took place 6,000 years ago in six literal days. The article was titled, "The Beginning and The Ending." The purpose of my January-February 2012 Lamplighter magazine is to emphasize the fact that a belief in the biblical story of Creation is not something limited to a few "Fundamentalist preachers." Rather, the concept of a young earth (together with a refutation of evolution) has been embraced by many with advanced degrees in science. The author of our lead article, Dr. James Hugg, came to believe in Creationism through his study of science. He concluded that special, supernatural creation and a worldwide flood were the best scientific explanations of what could be observed on earth and in the heavens. In my opinion, the Theory of Evolution and its assumption of a Creation that is billions of years old is the greatest fantasy ever conceived by the depraved mind of Mankind. I know that God's time is not the same as our time, since God is outside of time. And a day is as a thousand years. But the first verse in Genesis establishes the heaven and the earth, which is man's time. So it has to be a literal six days if the heaven and earth are created. Also if you believe in God as a creator, why would it be so hard to believe He can do it in our time of six days. There is a reason for the evolution theory. It relieves man of his responsibility to God. It is with much relief that a moderate christian student can go to college and be told by their professor that there was no creation. If their is no creation then their must be no God. If there is no God, then there are no consequences for sin. Thus they see themselves as liberated and want to share their new found liberation with others. This was a brilliant move by The Evil One to seduce millions from the Faith. We must know that the devil is the master deceiver. he will do anything to get us away from the truth. We have to know what the bible says for ourselves, and not trust what everybody says. I question my pastor if I think he is in error. If we omit certain truths from the bible, then we must throw them all out as far as I'm concerned. It's all or nothing with God's word .Many say they don't believe in the virgin birth, and are standing in pulpits every Sunday promoting lies. So, we do have to be verrrrry careful what we listen to. Folks have to be dumb as a brick to believe the evolution story of creation. I can't throw a bucket of bolts off my veranda, and see it turn into a car. Just won't happen. I do not believe that the earth was created in six literal days. I, employing scientific approach on religion, believe that the universe began to exist 15 billion years ago and the earth WAS evolved over 4.5 millions years ago. These are scientific facts which any scientist would not try to deny. That a handful of scientists believe in the six-literal-day creation should not blind us to the fact that evolution was and is the means by which God manifests his greatness. The complexity of the universe and the first cause are strong arguments of God's existence. Anony...then you don't take Scripture literally. Genesis 1:31; 2:1-4. God saw all that He had made, and behold, it was very good. And there was evening and there was morning, the SIXTH day. Indecisive as ever, man said ‘hm, it makes me think’! So God said “WHO IS THIS THAT DARKENS COUNSEL BY WORDS WITHOUT KNOWLEDGE? ” WHERE WERE YOU WHEN I LAID THE FOUNDATION OF THE EARTH”? God has a great deal to say to those who question His Word in Job 38. If God said He said, but didn’t say, then how can we believe Him when He said ‘believe in the Lord Jesus Christ and you will be saved … hm! I know who I believe and trust, even though I don't understand. Anon said "These are scientific facts which any scientist would not try to deny." I say, Anon...please explain the miracles of Jesus from with "scientific facts". If you indeed were to undertake my challenge I would stop you and say...nevermind, ye of little faith. From a previous comment: "There is a reason for the evolution theory. It relieves man of his responsibility to God." Darwin spent his entire life trying to figure out how life really developed. The evolution by natural selection idea was his solution. The existence or non-existence of a supernatural god had nothing to do with it. Thousands of biologists since Darwin have shown his ideas were correct. Today every time molecular biologists compare DNA sequences of two different living species, they can see the history of life with their own eyes. The evidence for evolution has become so massive it has become impossible for an educated intelligent person to deny it. When Darwin's young daughter died, it grieved him deeply and made him begin to question his faith in God. Because his faith was not formed on a solid Biblical basis, Darwin’s questions led him further away from the true faith and into his grandfathers reasoning, which took hold of his troubled mind and steered him into an un-provable theory. This theory fools itself it has 'evidence' based on a biased and corrupt interpretation of said evidence. Not only is there NO sensible or logical evidence for the theory of evolution, it is based on a replacement faith formed by rebellion against what God has plainly declared in Scripture. The THEORY of evolution is a demon orchestrated religion built on the sandy foundation of mans pride and arrogance. Darwins 'god' may well be dead; but the Creator God continues to speak through His creation. Its a shame that the grief of a father so embittered him, that it dragged him away from studying the Bible for all the evidence he needed to know about life eternal. Human Ape said "...The evidence for evolution has become so massive it has become impossible for an educated intelligent person to deny it." “Darwin's Theory of Evolution is a theory in crisis in light of the tremendous advances we've made in molecular biology, biochemistry and genetics over the past fifty years. We now know that there are in fact tens of thousands of irreducibly complex systems on the cellular level. Specified complexity pervades the microscopic biological world. Molecular biologist Michael Denton wrote, "Although the tiniest bacterial cells are incredibly small, weighing less than 10-12 grams, each is in effect a veritable micro-miniaturized factory containing thousands of exquisitely designed pieces of intricate molecular machinery, made up altogether of one hundred thousand million atoms, far more complicated than any machinery built by man and absolutely without parallel in the non-living world." Michael Denton, "Evolution: A Theory in Crisis," 1986, p. 250. “…Darwin confessed, "To suppose that the eye with all its inimitable contrivances for adjusting the focus to different distances, for admitting different amounts of light, and for the correction of spherical and chromatic aberration, could have been formed by natural selection, seems, I freely confess, absurd in the highest degree." Dragons or Dinosaurs by Cloud Ten. Bought this for my 16yr old grandson and he loves it. It expels many myths e.g. the majority of Dinosaurs were small, about the size of an average dog and even smaller. It is obvious that man gradually killed them off as 'pests', some of whom could fly and behaved much like a fox in the farmyard causing havoc. There are recent history accounts given by eyewitnesses in my area of the UK. @HumanApe, an Evolutionist will always start their argument with 1) we have the majority view so must be right, and 2) you'd have to be stupid not to believe it. Each type of "argument" is no argument whatsoever, but a marketing ploy used to coerce one into buying one's product, in this case Evolution. When you can present some factual proof for Evolution, then you'll have a viable argument. "There is a reason for the evolution theory. It relieves man of his responsibility to God." There is a reason for religion. It relieves idiots from the responsibility to accept reality. Anyone proud of claiming to have evolved from an ape is truely misguided and uneducated. Creationscience website has some highly intelligent scientists on it.. u should check it out. @Paul, interesting, since Evolution is based on faith and so therefore a religion. "There is a reason for religion. It relieves idiots from the responsibility to accept reality!" Yes, this is essentially true! Religion is a complex selection of superstitious and mystical inventions devised by religious man to raise funds to build religious empires. It keeps them in pretty clothes and gold encrusted buildings while keeping the masses ignorant, yet at their beck and call, and in abeyance to their vaulted delusions, in a largely successful industry of denying mankind access to the Biblical free gift of Eternal Life in Jesus Christ. This is freely available through Creator God’s free Grace of Salvation through faith, no works, in the God/man Jesus Christ who freely gave His life to pay the price of all sin, which is eternal separation from a holy God, so that we may be born again without cost to obtain a new human spirit and become the children of God by FAITH. Thus escaping the severe judgment of a holy and righteous God that will come swiftly upon all earth-dwellers who declares “It is the fool who has said in his heart ‘there is no God’” for everyman KNOWS that God exists, but wastes his life denying that knowledge in the vain hope that the threat of judgement day will – go away – otherwise known as the ‘Ostrich Syndrome’ in preference for their own highly complicated, leap in the dark, un-founded and crudely devised religious faith that there is no God. Knowing everything there is to know without exception is the one and only, fail proof system that their 'no god' religion can be proved true. Of such is their cry of 'reality'. What about the millions of Christians who don't believe in evolution, believe in the inerrancy of Scripture (not necessarily translations, however), believe salvation is a gift from God, but just happen to believe, as Dr. Hugh Ross does, that the "days" of creation were long period epochs. Think about Satin's rise, serve as the Morningstar, then fall during the days of creation - it all appears to have taken longer then a standard week. Also, the Sun was not even created until the fourth "day" (so evening and morning have no time meaning), and the seventh day was never apparently closed (so no time meaning again). "And the 'Special Creation' account is immediately followed by 'The First Slanderous Lie'..."
You also might consider the time differential between the Heavenly dimension and our "material" dimension.